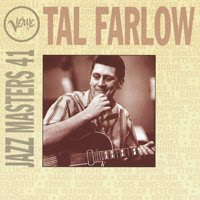 Talmage Holt Farlow (June 7, 1921 – July 25, 1998) was a jazz guitarist.He was born in Greensboro, North Carolina in 1921. Nearly as famous for his reluctance to perform publically as for his outstanding abilities, Tal did not take up the instrument until he was already 21, but within a year was playing professionally and in 1948 was with Marjorie Hyams' band. While with the Red Norvo Trio (which originally included Charles Mingus) from 1949-1953, Farlow became famous in the jazz world. His huge hands and ability to play rapid yet light lines, which earned him the nickname "Octopus", made him one of the top guitarists of the era. After six months with Artie Shaw's Gramercy Five in 1953, Farlow put together his own group, which for a time included pianist Eddie Costa. In 1958, Farlow retired from full-time performing and settled in Sea Bright, New Jersey, returning to a career as a sign painter. He continued to play occasional dates in local clubs, however. His fame endured and in 1962 the Gibson Guitar Corporation, with Farlow's participation, produced the "Tal Farlow" model in their prestigious Artist Model line. This guitar can be seen in the picture at right. He only made one record as a leader during 1960-1975, but emerged a bit more often during 1976-1984, recording for Concord fairly regularly before largely disappearing again. He was profiled in the documentary film, Talmage Farlow, made in 1980/81. The guitarist can be heard on his own records for Blue Note (1954), Verve, Prestige (1969), and Concord. He died of cancer at Memorial Sloan-Kettering Cancer Center in New York City on July 25, 1998 at the age of 77.